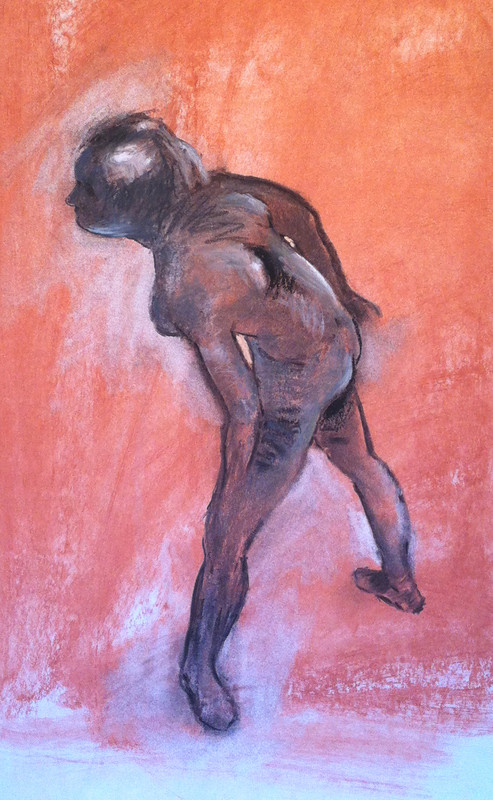 This time I drew the figure from photos I took of one of Degas' bronze ballerinas. More to come. I know the one. That's a hard twist. You did a fine job, not so Degas, more Bacon. I like this drawing. It's a good plan for a sculpture. Hi, Linda! I actually didn't get the twist right - she is more bent over. And, I neglectfully sent her leading foot forward, and after realized it was in a plié. I also noticed it lacks grace, which I used to impart more easily. This shows the attrition of my figure skills over time. It is sad, but I also feel that I have some tools to push me forward. The Francis Bacon reference is pure gold - thanks. Next, I will do some re-draws and eventually develop a person from this pose. I have pics from other angles, and may try a virtual poser to mimic this. Fun ahead!